Rider Balanced Control Rider Balanced Control gives the rider: - Flatter cornering without sacrificing the fun factor - More precise handling in all conditions - Better control in big bumps AND chatter bumps How did we get there? Polaris: - Put the rider in the right location on the sled. - Centralized vehicle mass. - Optimized the suspension geometry to better control pitch. Lightweight When developing the AXYS® platform, Polaris engineers minimized weight throughout the sled without compromising strength. The 600 Switchback Adventure is approximately 30 pounds lighter than the previous chassis and weighs approximately 30 lb. less than a competitive crossover model. 600 Cleanfire® Engine This liquid-cooled Cleanfire® engine with semi-direct injection (SDI) deliver outstanding throttle response and instant acceleration. These powerful, efficient engines start easily and reliably and they calibrate automatically as the temperature and elevation change. These engines deliver impressive fuel economy in real-world riding situations, which, for Polaris riders, means aggressive, up-tempo riding, not low-rev lab conditions. Now in the AXYS® chassis, the 600 engine features new lightweight integrated mounts, electronic oil pump and bypass thermostat. 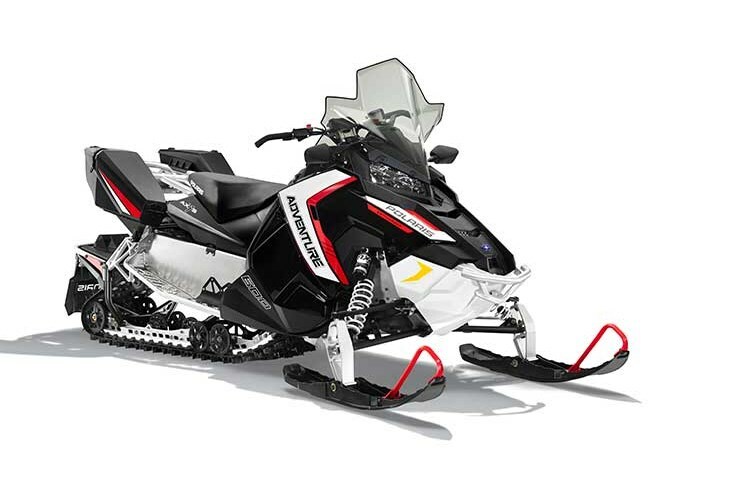 Interactive Digital Display Another industry first for Polaris - the most advanced instrumentation in snowmobiling. This 4.3" high resolution, full color, LCD digital display provides a rider with information including: - Sled performance: Speedometer, tachometer, dual tripmeters, & odometer - Sled operating conditions: Fuel level, oil temperature, diagnostics & maintenance warnings - Riding conditions: Air temperature, time of day - Bluetooth™ functionality: Enables the gauge to communicate with the rider’s cell phone and provide notification of incoming calls or texts. - GPS/Mapping Capability: A compass is standard, & full-featured GPS can be installed to provide directions & information about services such as fuel, restaurants, lodging & Polaris dealerships This gauge comes as an option on select SnowCheck models and is also available as an accessory option. Left-Hand Controls The left-hand controls feature improved ergonomics, updated styling, and enhanced hand and thumb warmer control. The controls are easy to operate with gloves on, and have an improved tactile feel.